Java moss (Taxiphyllum barieri) is a great plant to include in low-light aquariums holding variety of small freshwater tropical fish. It is one of the easier plants to grow, tolerates a wide range of temperatures, and will happily grow in just about any substrate or attach itself to any surface. Almost impossible to kill, java moss is a favorite of many popular freshwater tropical fish. Java moss is also known by a number of other common names, including Christmas moss, dubious bladder moss, mini moss, Singapore moss, triangular moss, and willow moss. Originally identified as Vesicularia dubyana, Java moss has recently has been reclassified as Taxiphyllum barbieri. Many references still use the original classification, and debate still continues over the accuracy of that change. Some assert that Vesicularia dubyana is a different species, known by the common name of Singapore moss. However, that view is also highly debated and many believe that these plants are, in fact, the same moss. A delicate moss, Java moss has small irregularly branched stems that are populated with rows of tiny overlapping oval-shaped leaves. The elongated bright green leaves of the submerged forms of Java Moss are much smaller than those that grow on land. Like other mosses, Java Moss has no true roots, instead absorbing nutrients primarily through its leaves. It will grow free-floating or will send out rhizoids to attach itself to rocks, decorations, driftwood, as well as to gravel or sand. Java moss is very popular as a foreground cover for sandy or rocky substrates, but it will grow on virtually any surface. It can be attached to rocks, driftwood, and aquarium decorations. Stunning carpets of Java moss are easily created by attaching it to plastic mesh, which can be laid on the substrate or against the side of the aquarium to create a living wall. Another use for Java Moss attached to mesh is to cover unattractive aquarium equipment. To attach Java moss to surfaces, place a thin layer on a rock, driftwood, or decoration in the desired location, then attach the plant by wrapping fishing line or cotton thread around it. To create a mat of Java moss using plastic mesh, place the moss between two pieces of mess and tie them together with thread or fishing line. Over time, the moss with grow through the holes and create a dense mat that can be used in a number of ways. Creative aquarists have formed mesh cones, balls, and other shapes on which to grow Java moss. Java moss can also be used as a floating plant to provide a spawning site for mop-spawning fish. Fish that build bubble nests, such as bettas and gouramis, also enjoy clumps of floating Java moss. Keep some floating, as well as clumps on the substrate, to provide lots of hiding places for fish. A mat of Java moss is also a great option for egg-scattering fish. The eggs fall into the moss and are protected from the adult fish. Java moss makes a great cover for tiny fry and juvenile fish. Mature Java moss also supports the growth of Infusoria—an ideal first food for newly hatched fry. Maintaining good water quality is the best care you can give Java moss. Periodic feedings with a liquid fertilizer will promote new growth and keep your moss healthy. Java moss on the bottom of the tank is prone to collecting debris, which can be unsightly and even damaging to the plant if large amounts build up. To clean the moss, remove it from the tank and rinse it well in water. Don't worry about being too rough with it, as Java moss is quite sturdy. 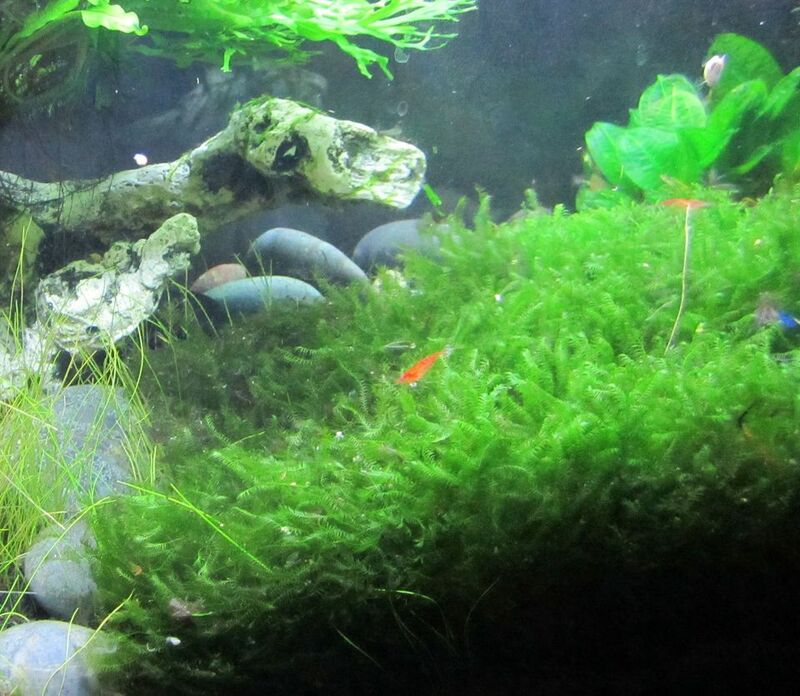 Perhaps the only common problem encountered with Java Moss is algae growth. Once algae begin growing in the moss, it is almost impossible to remove, and the entire plant has to be discarded. The best way to avoid algae growth is to avoid excessive light and keep the water clean. Elevated nitrates and phosphates, which tend to creep up when water changes aren't performed regularly, encourage algae growth. Java moss is a slow-to-medium grower and is propagated by division—to start new plants, simply divide pieces off the main plant and place them in another location. The division will attach itself to any surface by the use of root-like rhizoids. However, these rhizoids do not absorb nutrients as do roots; the only purpose they serve is to attach the plant to an object. Nutrition is absorbed through the stems and leaves of the plant. Generally, Java moss grows rather slowly, but increased lighting and the application of liquid fertilizer will promote more rapid growth. Warmer water temperatures tend to slow the growth of this moss. As it grows, the plant spreads both horizontally and vertically in rows, often forming dense tufts of heavy growth. As it grows, it should be trimmed to maintain a good shape and to promote further growth. Pieces that are trimmed can be used to start new plants.